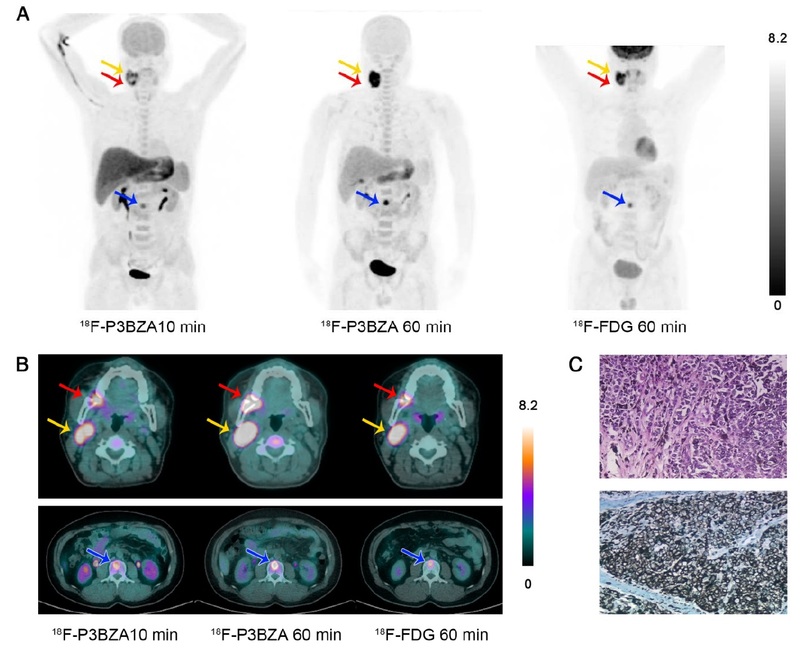 RESTON, Va. – A new nuclear medicine method for detecting malignant melanoma, one of the most aggressive skin cancers, has been successfully tested for the first time in humans and could improve detection of both primary and metastatic melanoma. The research is featured in the January 2019 issue of The Journal of Nuclear Medicine. FIGURE: Sample images of a melanoma patient. (A) Maximum-intensity-projection PET images at 10 and 60 minutes after 18F-P3BZA injection and at 60 minutes after 18F-FDG injection. (B) Transverse images of primary melanoma (red arrow), lymph node metastasis (yellow arrow), and bone metastasis (blue arrow). (C) H&E (upper part) and immunohistochemistry (lower part) images of primary melanoma. Credit: Xiaowei Ma, Shengjun Wang et al., Xijing Hospital, Fourth Medical University, Xi’an, China, and Stanford University, Stanford, CA. Authors of “Biodistribution, Radiation Dosimetry, and Clinical Application of a Melanin-Targeted PET Probe, 18F-P3BZA, in Patients” include Xiaowei Ma, Xijing Hospital, Fourth Military Medical University, Xi’an, China, and Stanford University, Stanford, California; Shengjun Wang, Shuailiang Wang, Daliang Liu, Xiaohu Zhao, Fei Kang, Weidong Yang, and Jing Wang, Xijing Hospital, Fourth Military Medical University, Xi’an, China; and Hao Chen and Zhen Cheng, Stanford University, Stanford, California. This study was supported by grants from the National Natural Science Foundation of China (81501501), the Key Program of National Natural Science Foundation of China (81230033), Shaanxi Science & Technology Co-ordination & Innovation Project (2016KTCQ03-09), the International Cooperation Program of Xijing Hospital (XJZT15G01), and the Office of Science (Biological and Environmental Research), U.S. Department of Energy (DE-SC0008397).